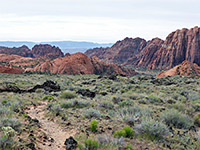 Snow Canyon is a small state park, less than 2 miles across, but contains over 20 miles of well-maintained, intersecting trails, all quite easy, which take hikers to all corners of the valley; to narrow ravines, lava formations, sandstone outcrops and sand dunes. Most of the routes start along the scenic drive, while a couple begin beside Hwy 18, and still more explore the less-visited south section of the park, the Paradise Canyon area. The Snow Canyon map indicates the location of each trail. This path is the shortest route to West Canyon Overlook, the most popular viewpoint in the park; it starts from a large pullout along the scenic drive, climbs over a sandstone outcrop (the Petrified Dunes) then follows the far side of the rocks northwards, later crossing a drainage and ending at an intersection with the Lava Flow Trail, a short distance north of the overlook. A cinder cone near the north edge of the park is the destination of a lightly used trail that climbs gradually up the east side of the peak then more sharply up the south side, reaching the top after 0.8 miles, from where a 0.3 mile loop path circles all of the crater rim. The longest path in the park links the Paradise Canyon area in the south with the Whiterocks Trail in the north, running close to the eastern boundary and Hwy 18. Part coincides with a paved cycle trail adjacent to the main road. Apart from the northenmost stretch, all falls outside of the fee area. The most interesting section is towards the south, where the land breaks up into a series of narrow ravines and sandstone outcrops. 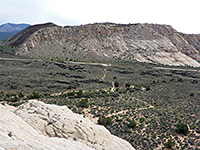 The Hidden Pinyon Trail is a nature path, accompanied by notices about the local plant life and geology; it follows the first part of the Three Ponds Trail, through sandy valleys and rocky outcrops. Jenny's Canyon is a very short slot, at the edge of the red cliffs on the east side of the park road; a popular destination for children. The trail into the canyon is closed each year between 15th March and 1st June, in order to protect nesting falcons. 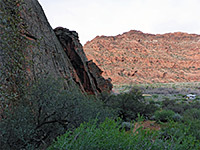 Johnson Canyon contains a sandstone arch and a seasonal spring, which sustains riparian vegetation including willow and cottonwoods. The path to the canyon begins just south of the park entrance station, first running along the edge of an extensive lava field, then crossing a usually dry wash and turning northwards into the cool, shady ravine. The trail is closed each year between 15th March and 31st October, in order to protect nesting falcons. This trail links the paved scenic drive with the unpaved West Canyon Road. The eastern half is busiest, crossing black lava deposits past at least two lava caves, to a junction with the Butterfly Trail and also with the short spur to West Canyon Overlook, a popular viewpoint that has a panoramic vista over all of the state park. Beyond here, the path descends quite steeply down bushy slopes, to the floor of Snow Canyon. The north end of the Petrified Dunes Trail is at a parking area along the scenic drive, shared with the Butterfly Trail, while the south end intersects the Three Ponds Trail. Most of the route is over smooth Navajo sandstone, initially fairly level, then sloping down along a narrowing ridge. The Pioneer Names are signatures from the 19th century, written along the base of a tall red cliff on the east side of the park road, visited by a short, easy trail. A quarter mile-long expanse of orange-colored sand dunes are visited by this short path, popular with families. Scout Cave is an elevated alcove overlooking Ivins and lands to the west, reached by a path that branches off the Johnson Canyon Trail, heading south along the edge of a lava flow, then bending east into a narrow ravine. Past the cave, the trail continues through more red rock landscapes to the Paradise Canyon area, where it ends at an intersection with the Gila Trail. 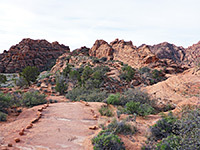 One of the longer trails in the state park, this varied route (also known as the Red Sands Trail) winds through little ravines and sandstone ridges then descends to the main valley floor, crossing Snow Canyon wash and continuing up a sandy tributary drainage to the point where it emerges from a very short slot canyon, forming a sequence of potholes that retain water for a long time after rainfall. 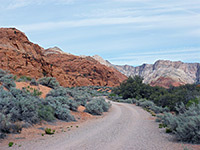 This gravel road, closed to public vehicles, follows the streambed of Snow Canyon all the way to its upper end, surrounded by high white cliffs. It is mostly used by cyclists, though several loop hikes incorporate short sections of the route. The paved Whiptail Trail follows close to the park road for most of its length, providing a quieter alternative to the highway for joggers and cyclists. There are several entry points, and the trail is the only one in the park that is fully accessible to people with disabilities. The Whiterocks Trail starts in the north along Hwy 18, crossing a sandy flat to the edge of a large outcrop of white sandstone, where a 0.2 mile spur leads into the Whiterocks Amphitheater, enclosed by smooth slickrock on three sides. The main route continues southwards, crossing part of the rocks then descending a steep slope to bushy, sandy terrain, and an intersection with the Lava Flow Trail. En route are several lava caves, and for all of its length the path offers excellent views along the valley.